[CONT](RC):If your drop zone has ten or more cards, this unit gets [Power]+4000. 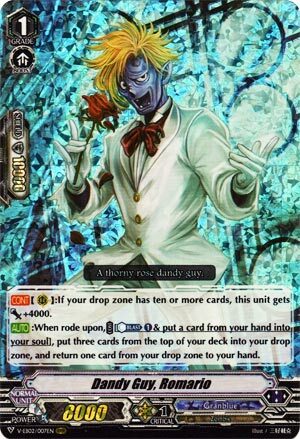 [AUTO]:When rode upon, COST [Counter Blast (1) & put a card from your hand into your soul], put three cards from the top of your deck into your drop zone, and return one card from your drop zone to your hand. So, we have a +0 wash when ridden on. Not like Circle Magus or similar. So how much does this matter? On one hand it’s a bit of a pisser that we only wash in hard advantage. I suppose though the payoff was that you could select your quality of advantage (to a point, it’s a random selection of three cards which is barely better in my mind) and load the drop zone to get Basskirk live as fast as you can. That’s a bonus though. He’s also a 12k booster Mid Game onwards which lets the deck hit numbers against Force Decks. I think the 12k booster thing was enough of a reason to run in large numbers at any rate. As it is, this is a 4-of just for consistency alone.